Celestron has been a leader in the optics industry for decades, but you may be more familiar with its telescopes than its sport optics. In addition to producing some of the greatest telescopes, including models that have been featured on television shows like Big Bang Theory, Celestron also produces binoculars, monoculars, and spotting scopes. Let’s take a look at what you can expect from the company’s spotting scopes, including some of their best models. If you’re tight on funds but still want an excellent spotting scope, the Landscout 12–36x60mm model is a good starting point. 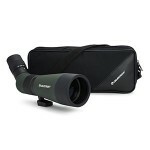 It’s durable and rugged, and provides an excellent image during daylight hours with 12X to 36X magnification. It’s fogproof and waterproof, but the BK–7 prism glass combined with the use of fully coated optics instead of fully multicoated optics makes this a poor choice for stargazing. Here’s a bit of an odd duck among spotting scopes: the 39–100x90mm Maksutov. This glass is built around a catadioptric design, a choice usually reserved for telescopes. It works out well for this model, though, providing you with a finder scope for easier target acquisition as well as magnification from 39X all the way to 100X. In essence, you can view the individual characters of a license plate from almost a mile away using this spotting scope. Also, a built-in T-adapter makes it easy to attach your SLR or DSLR camera to the scope. The only drawbacks are a junky included tripod, a setup that’s too bulky and large for handheld use, and the lack of weatherproofing and fogproofing. What Do Celestron’s Spotting Scopes Share In Common? Every model of Celestron spotting scope is different, with the majority of its models placing the focus knob just forward of the “knuckle” between the eyepiece of the maintube of the glass. Some models, however, have a focus body collar instead. One thing that every one of Celestron’s scopes does have in common, though, is the availability of an angled eyepiece. Most models are also available with straight eyepieces. Finally, every Celestronc spotting scope incorporates a porro prism design, but some models use BK–7 prism glass instead of BaK–4. Do I Get Any Accessories With My Purchase? All of these models include a nylon carrying case, which is usually quite good and protective of your investment, and certain variants will also include a hard case for even more protection. In some cases, you’ll also receive a strap for holding the spotting scope around your neck. Tripods are generally bundled with the glass, but these are just like most included tripods – mostly useless junk. Tough question, because it completely depends on which model you’re looking at. Celestron offers a fairly broad range of magnification levels, from 12X all the way up to 100X, depending on which one you purchase. Regardless of the particular spotting scope’s capabilities, you can be sure of one thing: a pristine, clear image throughout the entire magnification range, and a sight picture that has all of the three C’s (contrast, clarity, and crispness) in spades. How Challenging Are These Models To Use? Even the most complicated C90 MAK is a breeze to use, with intuitively-placed zoom and focus controls. Not only are the wheels easy to find, but they are always knurled nicely for steady movement even when you’re wearing gloves or have slippery hands. Once in a while, you’ll find a unit that has a “sticky” focus knob, one designed with just a bit too much tension, but that’s fairly rare. I’ve only come across it with the Ultimate entry in Celestron’s spotting scope catalog. How Good Is The Focus For These Scopes? 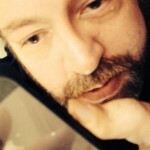 In every case, focus is sharp and easy. You won’t have any problems with accidentally bumping your target out of focus, since the knobs or collars all move with enough resistance to prevent that. With the Ultima, you may notice the knob sticking and then releasing a bit too strongly, making focus a bit harder to achieve, but even that is pretty rare. The one thing to be mindful of is that Celestron’s spotting scopes typically have a long close focus range of more than 26 inches. Do Celestron’s Spotting Scopes Have Good Optics? 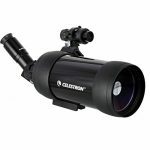 Before I started reviewing Celestron’s sporting optics, I assumed they would be top notch in terms of the optics technology incorporated into the design. I was mistaken, unfortunately. While some models offer fully multicoated optics, far too many of them only have multicoated or fully coated glass surfaces. The good news is that I’ve yet to notice any phase shift on the company’s spotting scopes, suggesting that phase correction coatings are applied to the prisms. What Are The Housings Like? Primarily, Celestron uses an aluminum or magnesium alloy housing coated with rubberized armor for shock resistance. This isn’t the case with the Maksutov spotting scopes, however, which feature just a bare metal housing that needs to be handled with kid gloves. On models with angled eyepieces, you’ll usually find a rotatable tripod ring for configuring your spotting scope into multiple viewing angles. Can I Use My Celestron Spotting Scope For Astronomy? While I’m sure Celestron would rather you purchase one of its telescopes for astronomy purposes, most of its spotting scopes are still quite useful for that purpose. The C90 Maksutov, in particular, is very good for viewing the moon and the planets orbiting our Sun, and I’ve even been able to get a fairly decent view of Polaris and other large, bright stars in the Milky Way galaxy. In most cases, Celestron spotting scopes are very durable. Most models are fogproof and waterproof, featuring lenses that are sealed with O-rings and nitrogen-purged optics chambers. The rubberized armor used in the majority of the firm’s scopes also makes them capable of handling bumps and falls. This durability isn’t universal, though, so make sure you check each model out individually to ensure it meets your particular needs and usage habits. Thanks for reading up on Celestron’s spotting scopes. This is an optics manufacturer with a wide variety of models to choose from, allowing you to find something that will work for almost any purpose. Their products are, almost always, terrific values that will provide you with years of great service.